Remember way back in 2011 when upheaval in the Middle East was the lead story on the news every night and the markets swung wildly depending upon how the protests went during the day. Well, two years later the unrest in Egypt is the lead story in most of the world's press, but in the US you can't find the story anywhere without really digging. The markets will likely start off the quarter with a nice bounce off Friday's computer driven panic selling. This will also be a shortened week because Independence Day Holiday and we have the jobs data out on Friday. Analysts have already started lowering their estimate for the number of jobs created in June. Here's a weird scenario to consider when thinking about the jobs estimates. If the number came out today and it disappointed, I think you could argue that stocks should rise because it will convince some that QE 4Ever is a go. However, if analysts cut their estimates during the week and ultimately, the consensus falls we could get to a point where the same number that would have disappointed us today could be viewed as inline or even BEATING expectations. How, the market would react to that sort of jobs report is a tougher call - would stocks rise because it's a sign of an improving economy (again, this is just a function of comparing estimates and has no real reflection on the state of the economy) or would they fall because because an improving economy means the end of QE is near? I read an interesting article over the weekend that discussed the three most valuable things you'll never learn in college. I think the author was onto something. 1) Manners - the author likened graduating college to moving to a new country. After college no one knows you or your story. All you have to impress them when they first meet you is your ability to smile, act polite and take every chance you can to start building a positive reputation for yourself. 2) Write effectively - If ever there was a dying art it would the written word. The author tends to focus on the need for 21st century writing (twitter/facebook, etc) but I'd argue that all writing - from a local news column to a well crafted thank you note to a silly blog - will stimulate the author's mind and lead to greater things. 3) Network - This one will probably surprise some but it's the truth. It's one of the mistakes I regret more than anything else during my career. I had close to 500 meetings with different people working on different start up ideas in 2000-2001. I felt like I was never going to see most of the people in the meetings again so I threw out almost every business card. Those contacts could have proved to be invaluable today but I did not feel the need to network in 2001. Just a friendly reminder that in our GPA/SAT obsessed world, there is a need for other skills as well. Finally, 2 stories from the weekend that made me smile and cringe (I'll let you figure out which is which). * Oregon passed a bill that will strip a non-profit's tax exempt status if the non-profit spends over 70% of their donations on administration. I would have preferred the threshold be a little lower (like 40% or 50%) but anything is a step in the right direction. The Supreme Court's decision to overturn a provision of the Voter's Rights Act last week received much less attention than it's other decision. States are clearly competent enough to manage this on their own without Federal oversight, right? Well, just in case we ever forget the ugly past of some of our states, please check out Slate's posting from the Civil Rights Movement Veterans which has a Literacy Test from Louisiana that was clearly designed to yield incorrect answers. A single incorrect answer could disqualify a prospective voter from voting. Take the test and see if you would have been allowed to vote. I think it's a little early to say 3-D printers will be the must have tech toy at Christmas but I think within 5 years most of us will have 3-D printers and the associated "toner" in our house. The first step in bringing 3-D printers to everyone was taken by Staples today which is now offering Cube 3-D printers for $1,300. When coupled with Makerbot's acquisition last week you can see that 3-D printing for the masses is on the way. If you're unfamiliar with the concept of 3-D printing you can see some examples here. Right now it's mainly a gimmick but there are more stories emerging every day of the way 3-d printers are changing the way things get done. Oh, Apple. They just can't catch a break. Yes, their still the second biggest company in the world and printing piles and piles of cash every day, but the tech world is fickle beast and despite having 80%+ of the tablet market everyone wants to know what's next. The latest swing and miss seems to be these odd "We make life worth living" sort of ads that started running 2 weeks ago. Finally, from the weird news files - Someone (I'm guessing her husband) is going to have some explaining to do. "A woman who reached for her lipgloss in the middle of the night got a nasty surprise when she realized her mouth was glued shut. She had instead covered her lips in super glue. Police said the Dunedin woman called them for help overnight, but because her mouth had been glued shut, it sounded like she had been gagged. When police arrived at the woman's house they realized what had happened and called for an ambulance. Ambulance staff were able to clear the woman's sticky situation without her requiring hospital treatment. Okay, so we're not quite Canadian living up here in NNY, but if you've ever been to Kingston, you are well aware of the metal grate bridge that exists at the entry to town. Apparently, it is nicknamed the singing bridge because of the different pitches that made by cars traveling at different speeds across the bridge. So in honor Canada Day which is next week a group from Kingston recorded and pieced together their national anthem with just audio from car tires. It's very clever. Well, the markets seemed to have dodged the proverbial bullet overnight again. The ugly close of the US market yesterday spilled over into Asian markets last night and in particular China. After a weak open, the slide gathered steam and the Shanghai index was quickly down 10% in the last 2 days. However, a rumor of more liquidity coming from China's central bank pulled the market back sharply when the computers decided a rumor is better than nothing. This carried over to Europe and the US where markets are now solidly green. The problem is that about an hour after the rumor emerged, the Chinese Central Bank and said liquidity is ample, thus there is no need for added liquidity. Thus, the rumor was denied, but the market reaction had taken on a life of it's own at this point. This is very reminiscent of the EU rumors from 2010, 2011, and 2012. We'll see how it plays out this time, but the markets are feeling very shaky right now. The end of this week should cause some interesting last minute trading fireworks. It's been some time since bothered looking at my blog stats because I don't post enough to monitor them. However, something must have happened last week. I posted - A little consumer protection post - on June 12th and it was initially trending like any other post. However, on June 15th and 16th there were HUGE spikes in traffic (and most of it seems organic). Ultimately, this became the 2nd most popular post I've ever made and pushed me over 200,000 total pageviews. Any ideas? Did any of you out there help me get a link or something that would cause such a spike? Drop me a note if you think you have an idea of what might have happened. So, this was one of those perfect weeks to be in NYC. I met a ton of interesting people working of really cutting edge technologies (and some others that should probably go find a day job). - if the rack you are trying to go to is full, you have to keep going to the next one and get there before your 30 minutes are up.... and the countless stories of racks not accepting returns or not releasing bikes. 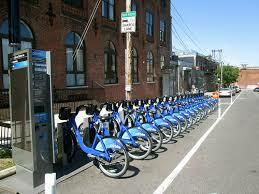 For a non-biking NYer, I could see Citibikes being worthwhile. For the cost of a Walmart, three speed you don't have to worry about air in the tires, storing a bike, etc, etc. However, for the tourist market (which coincidentally represented the bulk of the bikes I actually saw being used) they don't make a lot of sense unless you are just looking to do something new. 2) Zombies are hot. From World War Z to the Walking Dead zombies are everywhere these days. I always considered them a thing of geek fiction until I tried to walk uptown at 10am on a weekday. In the good old days, EVERYONE in NY was in a hurry. Walking was a sport and often a contact sport at that. So imagine my surprise when I hit the street and everyone is doing the Walking Dead shuffle - okay I'm exaggerating but the point is 90% of people were walking like they were out for a summer stroll in Cape May. After running over the 14th person under the age of 30 on the street, I decided to figure out what the BLEEP was going on. Arrggh! Apple and Samsung strike again! Everyone has to text and walk, 4Square and walk, youtube and walk, yelp, tweet and facebook and walk. Obviously, this leads to slow a slew of Walking Dead style 20somethings trying to figure out who is going to the opening of that new hop-infused brew pub tonight. Maybe instead of banning big sodas Mayor Bloomberg could ban texting and walking which would increase the average walker's heart rate allow them to burn off the calories of their 64 oz Mountain Dew! I'll have more on the NY tech scene in coming months hopefully, but suffice to say NY is really starting to challenge California in the start-up world. Kind of a far out topic but it's fun to listen to this guy riff on the whether or not math exixts. I can hear my kids now when I break out the summer workbooks tomorrow --- "But that guy said math is all in our heads....". It's a fun exercise just to think about it. So, after spending the better part of the past 10 months sitting in a mall I think I can make the following observation: people like to shop. I don't. It's not my thing and I'll never understand the joy of strolling through Sears for 45 minutes. However, I'm clearly in the minority. So, I'm toying with a new idea and I'm going to need some test users to validate the concept. Here's where you come in -- if you are a frequent shopper (like 1-2 trips to retailers/week) and have a camera phone you can be one of the first 25 participants. Email me - Brian@nnymath.com for further instructions. Once I have 15-25 users, I'll let everyone else in on the big reveal. A collection of stories recently popped up that highlight the lengths to which some will go to separate people from their money. In particular, two of these stories highlight the cost of being poor and outside of the traditional banking sector. We've long been aware of the cost to the poor that frequent check cashing stores (ie, payday loans) and pawnshops, but the emerging area of "Rent-to-own" keeps expanding as opportunities arise. 1) When I first read this story, I assumed it had to be fake. There's no way people are actually going to "rent-to-own" stores for TIRES, right? However, after a little research it seems that companies like Rimco, Rent-a-Wheel, and Rent and Roll, are indeed a real business. The examples used in this article are gut wrenching for me to read because it's a clear example of a business taking advantage of their customers' weak math skills. "When the tires on their Dodge Caravan had worn so thin that the steel belts were showing through, Don and Florence Cherry couldn't afford to buy a new set. The Rich Square, N.C., couple last September agreed to pay Rent-N-Roll $54.60 a month for 18 months in exchange for four basic Hankook tires. Over the life of the deal, that works out to $982, almost triple what the radials would have cost at Wal-Mart." "The tires on their Chevy Silverado were in terrible shape, too dangerous to be used for the long drive to his new job as an industrial painter. But they were such an odd size that the cheapest replacement set cost $1,340 at a regular tire store, far beyond Collins' budget. This spring, Collins, who owns a used-book store, made her 18th and final monthly payment of $164.10, bringing the total price for the tires to nearly $3,000. That works out to the equivalent of more than 120% annual interest, quadruple the highest credit card rates." I actually hesitated linking to this article because my fear is that someone will see this and say "Hey, you know what the North Country needs? Rent-to-Own tires where I can charge 120% interest!!" 2) Another company that makes my skin crawl is Coinstar - the provider of the ubiquitous green coin sorting machines spread around retailers everywhere. They will kindly count your coins in exchange for 10% of your money!!! So, turn in $50 of coins and they keep $5. Some people would be say "Hey, $5 to not have to roll 200 quarters? That's worth it." However, that's exactly the mentality that Coinstar is looking to take advantage of. Well, now Coinstar has come up with a new way to get their 10% and keep you spending. Rather than just getting 90% of you cash back, they'll now let you fund your Paypal account so you can keep online shopping without missing a beat. As Susan Waldman would say "Goodness gracious!!". Maybe one day we'll be lucky enough to have a TD Bank open up in our area where coin sorting is offered for FREE. 3) This story may have made the local news, but if it hasn't you need to see this list. A Tampa newspaper did a nice piece of research breaking down how much money various charities spend trying to raise MORE money. The results are discouraging. You'll notice that many of the worst offenders sound like real charities - for example, the Kids Wish Network sounds like some sort of mash up of Children's Miracle Network and Make a Wish Foundation. If a newspaper can make this determination by looking at tax filings it seems like IRS could as well. I'd love to see a bill reach the floor of Congress that said "if you spend less than 50% of your donations on direct aid for 2 consecutive years, you lose your tax-exempt status." However, I'm sure there are lobbyists from somewhere in North Dakota where the soliciting telemarketers live, that would argue that this would be a job-killer. Sigh. Politics. Can a video be a metaphor? Just a quick note on the market "comeback" today. Someone or more likely some group of high frequency traders were crushing the market at the end of the day with over a billion... yes, with a "b", quotes in S&P options which is incredibly rare. This sort of action seemed design to accomplish only one thing and that is to move stock prices higher. None of the other traditional risk assets participated in the late day surge which will make tomorrow (a jobs report day) very interesting. Large investors pushing home prices: Hmm, this probably will end well, right? Large financial firms making big bets nothing could go wrong. "Large investment firms have spent billions of dollars over the last year buying homes in some of the nation’s most depressed markets. The influx has been so great, and the resulting price gains so big, that ordinary buyers are feeling squeezed out. Some are already wondering if prices will slump anew if the big money stops flowing." "Blackstone, which helped define a period of Wall Street hyperwealth, has bought some 26,000 homes in nine states. Colony Capital, a Los Angeles-based investment firm, is spending $250 million each month and already owns 10,000 properties. With little fanfare, these and other financial companies have become significant landlords on Main Street. Most of the firms are renting out the homes, with the possibility of unloading them at a profit when prices rise far enough." Someone has come up with a device that allows people to generate and store power via a "soccket" ball. Very clever for those that live in areas without reliable power sources.
" In June a group of 20-somethings will kick off a soccer-related project with a global purpose that goes beyond athletic competition. They will start full-scale manufacture of soccer-style balls that generate and store electric power when kicked around. After playtime with these "Soccket" balls, families and communities that lack reliable access to electricity can use the balls' power for lighting and – eventually – other electrical applications. Surveys suggest that more than 1.3 billion people worldwide live without a consistent source of electricity. That lifestyle can cost money. "Some Mexican families spend up to a quarter of their income on candles and other light sources during months-long power outages," said Victor Angel, product manager of Uncharted Play, Inc., the company that developed the Soccket. It looks like an ordinary soccer ball on the outside, but the Soccket actually contains a small direct current generator and a storage unit. "As the ball rolls, the mechanism spins a generator to produce electricity that goes through our custom port and is stored in a lithium ion battery like those in laptops," Angel explained." In case you have some liquid oxygen laying around the house - DO NOT TRY THIS AT HOME - Enjoy the video from the comfort of your own home. There are a ton of reflective pieces offering advice to graduates at this time of the year. However, a recent article in the NYTimes where the author implied that employers are no longer impressed by a fancy diploma from schools like Yale really got people up in arms (particularly those that have just finished paying about $50k/year to attend Yale). "Since jobs are evolving so quickly, with so many new tools, a bachelor’s degree is no longer considered an adequate proxy by employers for your ability to do a particular job — and, therefore, be hired. So, more employers are designing their own tests to measure applicants’ skills. And they increasingly don’t care how those skills were acquired: home schooling, an online university, a massive open online course, or Yale. They just want to know one thing: Can you add value?" This really struck home with me because it was the exact conversation that I'd had with my kids just a couple of weeks ago. I reminded them that old-timers like me grew up in an era where you got good grades, went to a good school and hopefully landed a great job. That era seems to be nearly over and schools, guidance counselors, parent and students need to recognize this shift. Employers want people that can get the job done and they don't really care how you were trained to get the job done. I'm not saying everyone should abandon the traditional college model, but I am saying that students should do an honest cost/benefit analysis of a higher education degree. 2) Learn to use a phone to talk. I'm constantly amazed by the lack of conversational skills most kids possess. It's not bad among young kids but by the time kids hit the "texting years" their ability to answer a phone with a smile is lost. Be great on the phone and people will notice. 3) Be afraid, but take risks anyway. This is a hard one for a parent to relay to a child b/c we are constantly telling them what not to do in order to stay safe. However, I always say there are acceptable risks - jumping off a 5 foot slide is acceptable, while jumping off a 35 foot cliff would not. Start a business and if it fails you've learned from that experience about sales and taxes and customer relations. Stand up for something you believe in and actually start forming your own set of beliefs instead of parroting your parents and friends. These are scary propositions but they will make you a better person. 4) Take care of yourself. As the original author stated I too put on weight in college that I've battled my entire adult life. Yes, you may get struck by a bus or get some horrible disease but if you can increase your odds by exercising and eating better shouldn't you? 5) Be a great listener. I've had to work hard at this because of a past career. In one of my old jobs we met with 500-600 startups a year which meant 2-5 meetings per day with new people. The reality was that within 5 minutes I knew whether or not I was ever going to speak to the people presenting again. If it was a a NO then I usually tuned them out to work on a project in my head. This was a bad habit that I carried with me for many years. I believe I'm a better listener today but I'm still not perfect. PS - If anyone is interested, I am planning on running summer science camps at NNY Math in the Mall this July. You can CALL me at 315 212-5577 or email brian@nnymath.com. I've been saving up a bunch some stories that generally make me shake my head. First, a little market wrap-up. Today was the first Tuesday in the last 21 where the market didn't go up. That is the longest stretch ever and had gone from kind of goofy joke, "hey, look the market was up again, it must be Tuesday" to an actual trading strategy that some were following - buy on Monday, sell on Tuesday. This makes absolutely no sense - why would the day of the week determine the value of a company or the market in general? - but in today's market we have to learn to ignore the old way of thinking in favor of trend chasing. Right now the story of the day will be "Concerns about the Fed hurt stocks" or "Strong housing market fuels stocks" but the reality is far simpler. Watch the US dollar vs. the Japanese Yen. When the yen appreciates, stocks fall. When the yen slips, stocks rise. I wish it was more complicated but it's not. 1) Okay, you live 2,950 feet above sea level. Logically, you must have home owner's insurance coverage for.... Tsunamis??? That was the surprise this gentleman in Australia got when he was looking for some new home insurance. The company providing the quote tacked on a $300 Tsunami rider for the risk of some giant 3,000 foot wave crashing into Australia. 2) United airlines to institute a baggage "subscription fee" option. For a mere $349 (plus a host of other fees and conditions) you can now once again fly with the joy of knowing your bags may or many not arrived on time. Since United started charging for the first checked bag ($25) this seems like the logical "Netflix" version of their baggage model. At some point someone (Elon Musk?) will upset the apple cart in the airline industry. It's late so I'll follow-up with some other thoughts tomorrow.